Did you know that November was chosen as National Adoption Month by a Presidential Proclamation? It’s true! Government-recognized adoption awareness first began in the United States in 1974 when former Massachusetts Governor Michael Dukakis declared an “adoption week” in his state, and in 1995 former President Bill Clinton proclaimed November the National Adoption Awareness month. In the nineteen years since, Adoption Month has blossomed under the direction of the Department of Health and Human Services, offering government-sponsored activities and celebrations each November to help build awareness of adoption throughout the nation. With the partnership of thousands of community organizations all over the world, Adoption Month now represents a multitude of programs, events, and activities to share positive adoption stories, challenge the myths, and draw attention to the thousands of children waiting for permanent families. This year’s National Adoption Month theme is about the importance of sibling connections for the 102,000 children and youth in foster care waiting for adoptive families. To get involved with the programs, events and activities happening nationwide next month or for more information about the history of National Adoption Month, please visit https://www.childwelfare.gov/adoption/nam. 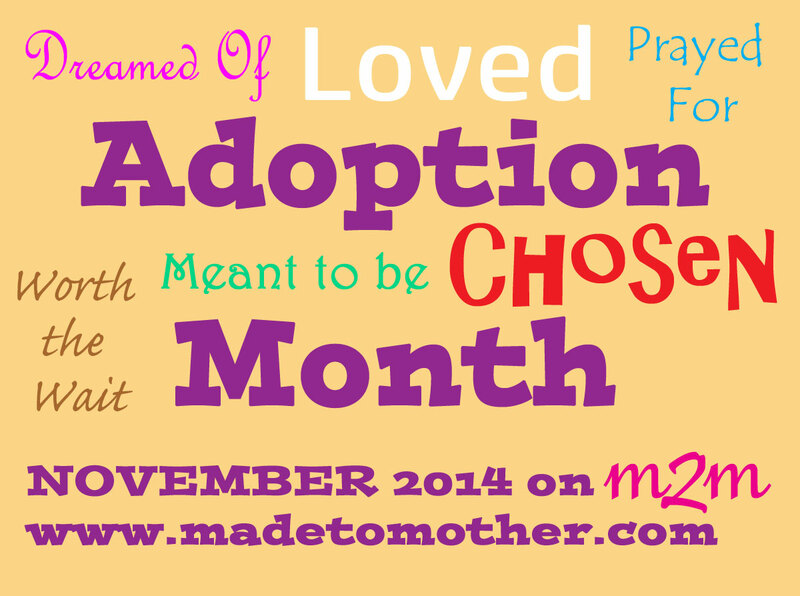 And don’t forget to come back here next month and read some of the AMAZING adoption stories that I will be sharing each week as part of the special M2M Adoption Month series! If you still want to submit your own adoption story for this series, please email it to me at wynterkaiser@gmail.com by 11/2/14! 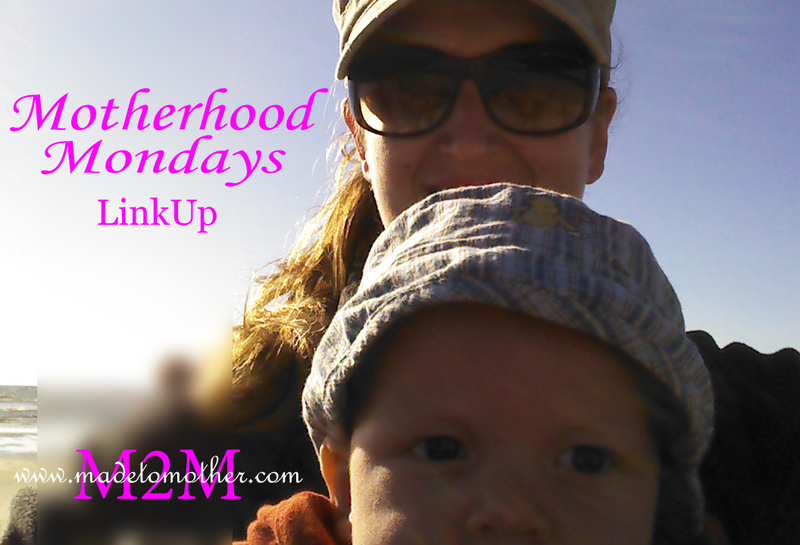 And now for the monthly Motherhood Monday Link Up! Please also visit M2M on Twitter @made2mother and like on Facebook.com/madetomother! I DIDN’T know this. What a beautiful and necessary thing to set aside a month of awareness for. Thank you for sharing. I didn’t know there was a whole month dedicated to adoption. Thanks for making all of us aware. I’m adopted and I had no idea there was an adoption month! So cool to bring awareness to everyone. What a great initiative. I don’t think we have that here in Australia. I wish adoption was as easy or open in Australia as it is in the States. Oh I love hearing adoption stories. I can’t wait to hear what goodies you’ll have to share in November. It takes a special person with a huge heart to adopt a child. I used to work at Children’s Division. The kiddos waiting for a forever home need to belong, be loved, and be cherished. Thank you for raising awareness about National Adoption month. I did not realize there was a special month dedicated to adoption, there should be. Stopping by from the “Let’s Get Real” Link party. One of my sons and his wife have two little foster boys that we would love to see them adopt. IT is so sad to see the situation they came from and the great hope they would have being a part of this wonderful family. I had no idea. And that sounds like a really great series! Thanks for linking up on Equipping Godly Women Fellowship Fridays! This is great I had no idea that they had a month for this! Thanks of sharing!